After 18 months of semi-perpetual touring, Braids may have been weary last night (July 27) — frontwoman Raphaelle Standell-Preston almost admitted as much as she addressed the crowd — but they didn't let that get in the way at the first of three intimate homecoming shows. Braids put forward a robust sound, punctuated by Standell-Preston's soaring vocals: her ability to convey angst and emotion while nearly belting offered multiple stunning moments throughout the night. But with the group sticking heavily to their 2015 release Deep in the Iris, the most exquisite performances were those that allowed some of that album's quietness to linger while still offering glimpses of Standell-Preston's unquestionable vocal talents. Opening number "Happy When" succeeded on this front, slowly building a sound that eventually filled the room. "Warm Like Summer" showcased Braids' full range, beginning with a mesmerizing low-key wall of sound created by drummer Austin Tuft's wails before descending into a frantic tapestry of drum and keyboard lines. Standell-Preston's introduction to "Miniskirt" was emotionally shattering, a bitter twist on a torch song before shifting into an angrier, noisier mood. The noise worked on "Miniskirt," where it complemented the raw anger evident in the vocals (about sexual assault and misogyny) and added more urgency through the use of frenetic, cyclical drumbeats and off-kilter drones and synth noises. It resonated strongly and tangibly with the crowd. Yet elsewhere in the set, there were moments where Braids could have toned things down. 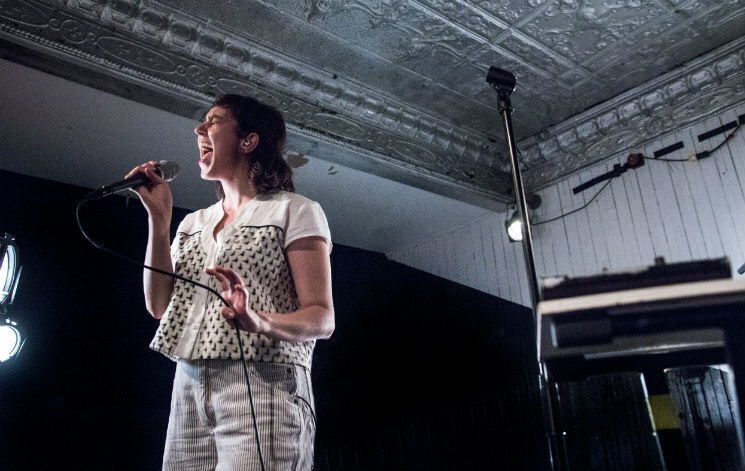 Unlike Braids' last hometown show on the dance-oriented late night stage at Pop Montreal, this was a cozy show space, and some more restraint would have truly allowed the show to connect more with the crowd of just one hundred. This weakness was most glaring on "Hossak": a story about a boy creeping up to one's bedroom window at night while brandishing pizza doesn't lend itself to bold, loud drones and guitars that hit all the eaves and far corners of a room. While Braids struck more of a balance as the show went on, "Bunny Rose" hit similarly rocky ground, putting a noisy wall between performers and audience. But maybe that's nit-picky: the full house crowd didn't seem fazed by a lack of intimacy — rather, they lapped up the solid show from a trio of beloved locals who were more than happy to oblige a hometown crowd. Toronto six-piece Bernice, meanwhile — who Braids handpicked as their support — offered a cohesive sonic warm up for the main act. Their understated set was charmingly sparse, offering tunes that oscillated neatly between ethereal dissonance and almost a cappella melodies, accompanied by a crisp smattering of almost hip-hop-leaning beats.